Please bear with me tonight, I had my wisdom teeth removed today, so I’m taking pain killers. Let’s just say, I’m a bit off my game. Most people who are treated for hyponatremia are already in the hospital for a secondary issue, like burns or liver transplants, etc. I believe persons who are being treated for other conditions are at a higher risk for a delay in diagnosis for hyponatremia. This would make it most likely for them to develop chronic hyponatremia (chronic, meaning longer than 48 hours, up to a few weeks). This will put them at higher risk for developing CPM/EPM. That said, it is harder to diagnose these individuals with CPM/EPM because they are already ill. Most will be experiencing issues with nausea, headaches, vomiting, etc. They may even already be in a coma, so the symptoms will be attributed to other issues. If you’re already in the hospital with a major disease, injury, or disorder and then develop hyponatremia followed by CPM/EPM, you will probably have significant damage. To be honest, you probably won’t make it. If you do live through those major health issues, you will be lucky to get a diagnosis of CPM/EPM. Here’s why: in most cases, if you are already in the hospital for something like severe burns, to help manage the pain, the hospital will sometimes put you into a medically induced coma. If you are in a coma, it is difficult for the hospital to know if you are experiencing neurological issues. When they awaken you from the coma, they might deduce that the issues you are having are due to the induced coma. If you have cancer, they might believe the issues (nausea, headache, balance issues) are due to the cancer especially if you have something like a brain tumor and especially if you are having chemotherapy treatments. Depending on your doctor’s expertise and the symptoms you present with, you may not get a diagnosis of CPM/EPM right away. CPM/EPM can appear on a MRI as early as two to three days; however, it may not appear on a MRI for up to two to four weeks. In less severe cases of CPM/EPM, your symptoms can begin to improve within a week after the injury. This makes it even more difficult to detect because doctors are even more likely to attribute the symptoms to the primary reason for hospitalization, so they don’t look for it. To complicate things further, most individuals will begin to experience a disappearance of the lesions on the MRI as early as 4 to 6 weeks. In most cases, the lesions can completely disappear in 4 to 6 months. Despite the healing of the lesions, symptoms may or may not approve accordingly. In most research papers that I read, most lesions will disappear but a person will have ongoing issues with dystonia, speech issues, cognitive and learning issues, tremors, etc. Generally, the symptoms that remain after the lesions have disappeared are related to motor functions and cognitive functions. There can also be on going issues with behavioral and psychological deficits. This leads to a misdiagnosis, or you may not ever get a diagnosis. Get your medical records. Look for hyponatremia (keep in mind that CPM/EPM does not always occur with hyponatremia), but it is most common with it. You can also request a MRI. A really good neurologist and/or radiologist can see something called sequelae. Basically, this is, for lack for better words, scar tissue. It is usually very difficult to see in our current scans. So, if you really believe CPM/EPM is responsible for your issues, you might have to see several neurologists or radiologists. Some doctors will diagnose you based on symptoms and your clinical history alone. For arguments sake, let’s say you really don’t have CPM/EPM. If you have symptoms that aren’t typical for the disorders or diseases that you experienced, you should pursue getting answers anyway. I’ve been a patient for more than 8 years. I’ve been diagnosed with other health issues/ disorders before I was injured from CPM/EPM. From past experience, it is common for doctors to attribute any new symptoms that you may have to the previous diagnosis. Basically, they think that since you have one disease or disorder that you will not be unlucky enough to develop another. They might also attribute these new symptoms to being a psychological issue. They will state that this new issue is due to the stress of having a previous illness. Follow your gut instinct! Only you know what you are going through. If you keep getting the run around from one doctor, find a new one…BUT whatever you do, do NOT tell this new doctor that he is your second opinion. Trust me, I know. It is hard to find a doctor who will go against what another doctor has diagnosed. It shouldn’t be that way, but it is. You may be very blessed and have a doctor whom you do trust, if that’s the case, level with them. If he’s a great doctor, he will look into new possibilities. In the end, you should find a diagnosis that answers ALL the questions, fits ALL the symptoms. In your situation, look at the symptoms of your initial disorder/disease, and check out CPM/EPM symptoms. You have to a detective. You also have to be your own advocate. If you’re able, look for information online. We are in a fantastic technological age where information is just a few key strokes away. Take advantage of it, but try not to be consumed by it. Easier said than done, I know. I was trying to get into med school before I developed CPM/EPM. It happens to the best of us that the more we read about disorders or diseases, you start to believe you have every disorder that you read about. To keep this from happening, I would recommend with coming up with your list of symptoms and the dates that they began BEFORE you start doing any research. Take your time in coming up with this list. It’s easy to forget little things, and you don’t want to begin adding things after you start researching because you’ll end up in the same position where you start thinking you have every disease imaginable. Things to look for on the MRI. Previously, I mentioned that T1 and T2 MRI‘s showed high signal intensity; however, only T2 shows high signal intensity, but T1 shows low signal intensity. This means in T2 MR images, the areas of damage are bright, and in T1 the same areas of damage are darker than surrounding areas. This information might come in handy when you get your medical records. If you review your radiology reports, you might find these things defined, and this is what it means. Sequelae: an abnormal condition that results from a previous injury or disease. If you are reading it on your radiology report, then it means that there was a previous injury that has caused an abnormality on your MRI. An EEG may or may not show abnormalities. If there are abnormalities, than it is usually present in theta and delta activity. Usually these abnormalities will also improve in the following months. …….bilateral hyperintense areas within the putamen, caput nuclei caudati, and lateral thalamus (figure). Subsequent control images made up to six months after the onset of the condition showed a marked decrease of these signal intensities. An EEG disclosed diffuse slow background activity and bilateral theta and delta activity which improved gradually during the subsequent months. The higher incidence of extrapontine lesions in recent series and ours may be due to the availability of better-quality MRI picking up subtle lesions. Also, the extent of involvement in the imaging depends on the interval at which imaging is done after the onset of ODS.2 21 The MRI done early (1–6 days) in six (24%) of our patients failed to show any abnormality. However, in all these patients, a repeat MRI done 1–2 weeks later showed positive findings. Therefore, we concur with the other authors that a repeat MRI after 1–2 weeks in all clinically suspected cases of ODS is very helpful.2 Also, diffusion MRI can pick up early lesions when conventional MRI is still negative. CT was done in seven cases and was positive in two (28.5%). All had MRI-detectable lesions (n=23). Six required repeat MRI as the initial one did not reveal any lesion. The mean interval between the first and repeat imaging was 10.6 days in these patients (range 9–17 days). There were T1W hypointense and T2W and FLAIR sequence hyperintense lesions involving pons (76%), basal ganglia (76%) and thalamus (20%) (figures 1 and 2). Contrast enhancement was not seen in any of the cases. 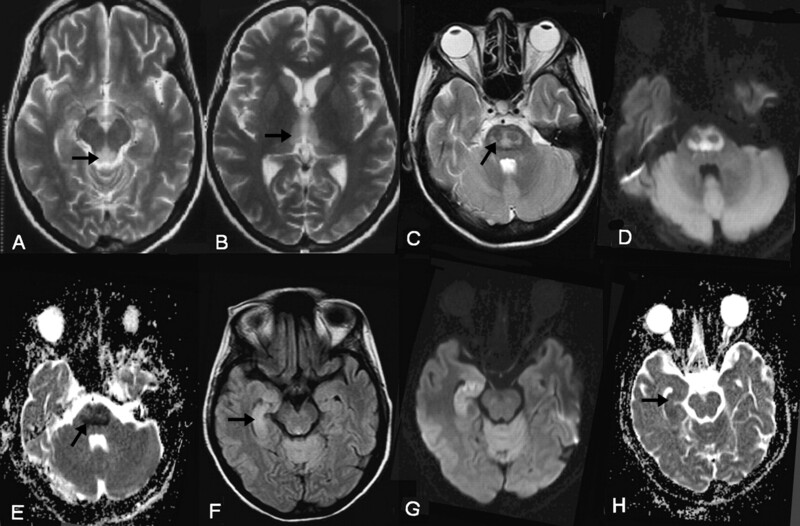 Diffusion-weighted imaging (n=3) showed a restricted diffusion in two cases. The radiological findings are summarised in table 3. Okay, so since I’ve gone on a bit. Please trust me when I say, that this information comes up in pretty much every research paper. This is also a few more types of imaging that have been used to detect CPM/EPM that I wasn’t aware of previously. I do not know anything about what this means, so I will have to get back to you when I know for sure what it refers to, but TcTrodat-1 and 1-IBZM spect images show higher correlations with the severity of clinical features in EPM than MRI alone. (Annals of Nuclear Medicine 2009 23, 409-412. In summary: MRI is the best method to diagnose CPM/EPM. It usually may not show the lesions until 1 to 4 weeks after injury. The CT scan is the worst at detecting damage. The spect images mentioned above might be a better way showing the damage that correlates to symptoms. The MRI signals usually detect the injury for a few months, but then shows improvements that do not necessarily correlate with the severity in symptoms. This is also true for EEG abnormalities. You may have an abnormal EEG, but improvements usually show within months but do not necessarily correlate to the symptoms you experience. Finally, trust your symptoms. If you had issues with hyponatremia while being hospitalized for a different condition, be sure to access your medical records and consult with one or more neurologists or radiologists to try to determine whether or not CPM/EPM is responsible for issues that seem unrelated to your original conditions. I’m sorry for the length of this post. I hope it doesn’t ramble too much and that you find the information useful. UPDATE: 04/20/12….I just wanted to leave a little bit more information regarding imaging. I mentioned above the FLAIR imaging, and I wanted to explain exactly what that is. Fluid-attenuated inversion recovery (FLAIR) Magnetic Resonance images stands for FLAIR MRI. It can be used in a two dimensional form or 3D form. This type of imaging can produce an image without showing the fluid in the brain. This type of imaging is used to detect lesions in the brain, and is very useful in diagnosing demyelinating lesions. It is supposed to be a great way to determine lesions caused by MS. I do not have a lot of information regarding CPM/EPM lesions, but it is being used in diagnosing it along with standard MRI’s.